Republican Don Blankenship is filing to run for Senate in West Virginia, taking on the state's sore loser law that prohibits candidates who lost in the primary from running in the general election. The Blankenship campaign acknowledged that the West Virginia secretary of state's office was unlikely to certify his candidacy, but described his plan to file papers as a first step toward getting around state law and earning the right to challenge Democratic Sen. Joe Manchin in the midterm elections as a third party candidate. Holy crap! Democratic incumbent Joe Manchin has been considered the most endangered Democrat in the US Senate, but the Republican voters in their primary tomorrow may grant him a reprieve ... if they choose felon coal baron Don Blankenship to run against him. National Republicans are so worried about that outcome that they induced Corporal Bonespurs to tweet this morning a warning to WVa voters not to vote for Blankenship. "Remember Alabama," DJT tweeted. Being dissed by the Twitterman is ironic, isn't it? Because Blankenship fancies himself another Trump. In fact, "trumpier than Trump!" -- similar appetites, personality, and carelessness with the truth. 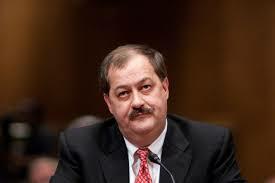 If Blankenship is able to throw a clod into that West Virginia churn, Manchin's prospects will get much brighter. Manchin is perhaps our least favorite Democrat in the US Senate, but we'll take him over any Republican on most days.